Happy 2018 to all our readers! Just when you thought the festive season was over, here’s a quick reminder that in some parts of the world Christmas is still to come. In Russia and parts of eastern Europe, the Orthodox church uses the Julian calendar, leaving a 13-day lag between the two Christmases. To mark the big day we’re making our version of borsch – a dish that varies considerably across eastern Europe and the former Soviet Union. The spelling also varies with both borshch and borscht in use. In Ukraine, borsch forms an integral part of the Christmas Eve table, and it’s often veggie-friendly as this day is also the end of a period of fasting – meat and dairy products are not consumed in the run up to Christmas. 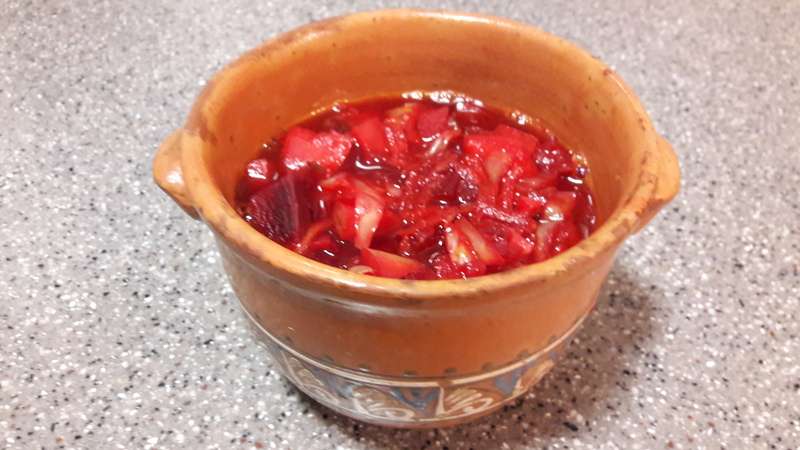 We’ve added some dried mushrooms to the beetrooty mix to give the stock more depth and put a bread topping over the pot to have something handy to tear up and dip into the borsch. Clean the beetroot, wrap in tin foil and bake in an oven pre-heated to 180 c for one hour. Pour boiling water over the mushrooms and allow to stand for 30 minutes. While the beetroot is cooking, heat the olive oil in a heavy-based pan and fry the chopped onion and garlic on a medium heat for ten minutes. Add the bay leaves and chilli flakes and then add the sliced mushrooms. Cook for five more minutes then add the tomato puree and the vegetable stock. Bring to the boil and then add the diced potato and carrot and cook for 15 – 20 minutes over a low heat. After the beetroot has cooled, peel it and then dice it and add to the soup. Add the finely sliced cabbage, chopped parsley and lemon juice and cook for another 15 minutes. Prepare the bread topping by combining the flour, water and oil and knead until you have an elastic mixture. Cover with cling film and leave to stand for 30 minutes. Pour the borsch into individual serving bowls, place a disc of rolled out bread over the top of the bowl and cook in an oven pre-heated to 200 c until the bread is cooked and starting to go brown on top. For non-vegans, add a dollop of sour cream after breaking through the bread cover. Use the bread to mop up the borsch. The year’s first succulent figs, in delicate green shades or striking mauve hues, are making their annual debut in Datça and to mark this moment we’ve come up with the figito, a cocktail that combines new season figs with white rum, mint and lemon – our spin on the classic mojito. One of the pleasures of walking round town at this time of year is stopping off to pick a juicy fig or two from the trees that abound in this area. Here’s a tree near the Knidos Cookery Club HQ with some prime fruits drying in the August heat. If you’ve got a glut of figs, then why not try this old favourite from last summer: Lord Venal’s Fiendishly Figgish Chutney, and enjoy a figito or two while you’re making it! Cheers, or Şerefe as they say in Turkey! Peel and dice four of the figs and muddle with the mint and the juice from the lemons with a wooden spoon in a glass serving jug. Add the rum and mix well and then top up with bitter lemon and soda water. Serve over ice with a slice of lemon, a mint sprig and half a fig.